There are more than 3.75 billion people using the internet today, that’s more than half the global population. As everything moves online, the more demand for freelance digital marketers there is. Digital marketing is one of the best jobs to earn money and travel the world with and encompasses a variety of skills such as advertising, social media, blogging, SEO, content marketing and more. 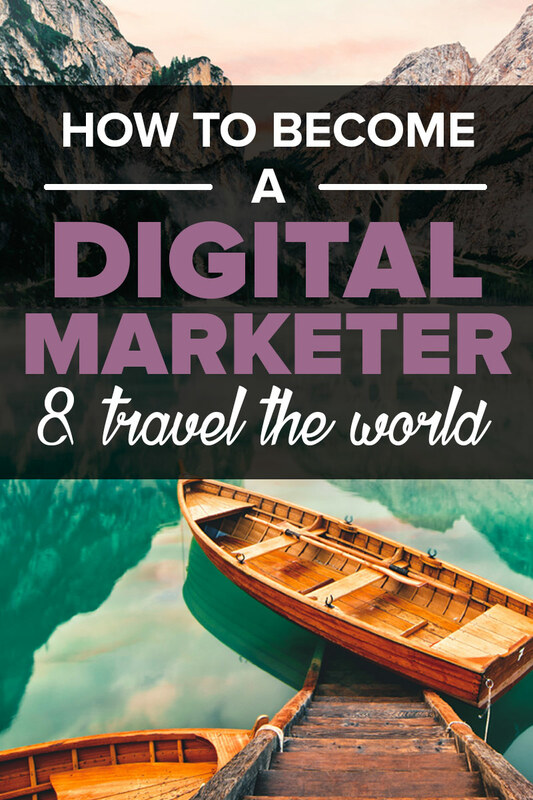 So how do you become a digital marketer and make that digital nomad dream come true? Any kind of marketing is always about reaching out to your audience wherever they are and at the right time. Digital marketing isn’t so different. Digital marketing is about connecting with audiences in the place where they are spending most of their time – the internet. So in other words, digital marketing is any form of marketing done online. As a digital marketer, your job will be executing marketing campaigns using online platforms such as social media, advertising platforms, websites, email and mobile phones to promote and drive sales of various products and services. What skills do you need to become a digital marketer? Having the right skills is what will determine your success as a digital marketer. The best thing about digital marketing is that it’s a large umbrella of services and you can therefore, pick one area and perfect it. However, no matter what area of digital marketing you choose, there are a few skills that every digital marketing specialist should have. Good copywriting skills: Digital media is driven by content. You will not escape writing content. Good copywriting skill is something you must develop if you want to run a successful freelance digital marketing business. You have to be able to use words to tell a brand’s story and be able to convince people to take an action that leads to sales. Social media channel expertise: There are various social media platforms that digital marketers use to promote products and services. Even if you work in SEO or only run paid ads, you will be a more attractive prospect for clients if you at least understand the basics of marketing on the most popular platforms such as Facebook, Instagram, Pinterest and Twitter. Basic design skills: Visual graphics are the number one driver of social shares. People want to quickly process information rather than read too much test. So don’t be surprised when clients ask you for photos or videos as part of your services. It helps to have basic design skills so that you can offer social media graphics or even ad design as an added service. Learn how to use basic design platforms such as Canva or learn how to use Photoshop. WordPress: Websites are one of the top digital marketing platforms businesses are using to market themselves online. More than half of the websites available are built on WordPress platform. Learn how the platform works so that you’re able to offer your client basic web support whenever necessary. Quick learner: The digital marketing world changes so fast. What was working a week ago could be obsolete today. You therefore, need to keep learning and adjusting as fast as the trends if you want to keep up. Analytical skills: At the end of the day, the client wants to know if there is any return on investment. Is it worth it to pay you for your services? The only way to answer this is to measure all your tactics. You need to be good at analysing all your online marketing data and prove your worth. How much traffic did you drive to the websites? How many downloads did you get this month? Did your Facebook page likes and engagement grow? By what margins? You must be able to keep an eye on important success metrics at all times. With the availability of different digital platforms, the opportunities of digital marketing are also diverse. There is an array of services that you can offer as a digital marketer. Most online businesses depend on content to create awareness about their products and services. As a content marketer, you will be creating content such as blog posts or even video content with the goals to create awareness, generate leads and grow customer base. In addition to creating the content, you will also be responsible for creatively promoting the content and getting it seen by the target audience. A good content marketer can get into the minds of their audience and understand what content they will engage with, and then, deliver it to them. This is a highly in-demand service because it’s somewhat more technical than other services and most business will prefer to outsource it, than do it for themselves. With millions of websites on the internet, effort is required to make sure that customers are able to find a particular website. This is where SEO comes in. Using various tactics, as an SEO expert, you need to be able to make sure that your clients’ websites come up top of the search engine results (and it converts to traffic for them). This is probably what comes to everyone’s mind when the term digital marketing is mentioned. Social media is big business. Every business wants to have some sort of social media presence and thus the need for social media marketing specialists. Popular platforms include Facebook, Twitter, Instagram, Pinterest and LinkedIn. The social media manager’s job usually involves creating platform-specific content to engage the business’s audience with the end goal often being better visibility, more engagement, website traffic and even sales. Email, even in the era of social media, is still thriving. In fact, companies are now paying more attention to email marketing and hiring experts to run their email campaigns. Email list building and keeping this email list engaged can result in big bucks for a business. If you can provide businesses with skills that will help them achieve this, you have a digital marketing niche, sorted! Web traffic is important if you want your customers to find you online. While organic traffic is the best, you can’t always rely on it alone – especially in highly competitive industries. You can also drive traffic to your products and services using paid advertising. Running paid ads seems easy at the face of it. However, to truly maximise your return on spend, businesses need someone who has an extensive knowledge of how online advertising works, hence the need for a PPC specialist. Google Adwords is probably the most important PPC platform. It can bring great returns for businesses but many find it too overwhelming to understand. Learn this skill and sell your expertise to business owners and save them from the overwhelm. A growing field of expertise is the social media adverting specialist. The most common job in this area of work is Facebook advertising but often also involves Instagram, Twitter, LinkedIn and even Pinterest advertising. The social media advertising expert needs to have a very good understanding of how social media platforms work but that’s not all it takes. You must also be able to analyse and optimise ads on these platforms for maximum returns. You will need to have a very good understanding of the advertising platform on the social media channel of your choosing and be able to use the targeting opportunities (and more) to your client’s advantage. This will lead to more conversions, sales or traffic for your client. This is the use of software to automate marketing actions, for example, social media posting or email marketing. Automation is important in marketing because it allows businesses to schedule repetitive tasks ahead of time allowing them to focus on other tasks. However they don’t always have the expertise to do this themselves. Marketing automation specialists help make the job easier by setting up automated workflows for various marketing channels. For example, platforms such as Hootsuite and Buffer are popular for social media scheduling while MailChimp and Aweber are popular for automating email marketing. A marketing automation specialist will design the workflow and use specialised tools to automate processes that make life significantly easier for businesses. Data and analytics are a crucial marketing skill in the digital marketing world. If you’re good at analysing online data (usually through Google Analytics) and recommending future marketing and business actions based on it – this is the role for you. You would look at a client’s analytics for various marketing channels and gauge performance and then offer them suggestions for improvement. This could involve analysing performance of ads, social media platforms, email campaigns and web content. How much do digital marketers make? According to the 2016 Salary Guide by The Creative Group, there was a 3.8% increase in pay for various positions in digital marketing from 2015. These earnings are for full time digital marketers, but, they give you an idea of how valuable the services are. Digital marketing consultants charge between $50 – $150 per hour for their services, depending on their level of expertise. Now that you understand what digital marketing is, the services that you can offer and the skills that you require – let’s take a quick look at a step-by-step process on how to become a digital marketer. As you have seen, there are lots of services that you can offer as a digital marketer. If you want to run a successful digital marketing business, don’t be a jack of all trades and attempt to offer all the services thinking that this will improve your chances of getting clients. Instead, pick one or two closely related services such as content marketing and social media marketing and perfect those services. This will make you an expert in this area. It will also be easier for you to keep up with the ever changing trends. However, you do need to learn the ins and outs of digital marketing so DON’T skip this part. You learn by doing. Once you’ve earned a skill or two, you need to put that theory into action. Do so by practising your chosen digital marketing skill at every opportunity you get. Getting clients with your limited experience at this stage will be tough. So to start out, we suggest doing small and even free jobs for friends and family. You could also work for free for a short while for startups and nonprofits who are always looking for help. This will be a good chance to try out what you’ve learnt and wet your feet into digital marketing and working with clients. You could also do lesser paid jobs or digital internships (some startups offer this) and use it as opportunity to put your skills to use in real life. When it comes to being a digital marketing freelancer, you certainly need to build some sort online presence. You can’t promote yourself as an digital marketing expert when you have zero online presence. Clients aren’t likely to find that very reassuring. Depending on the service you want to specialise on, the skills you’ve acquired and also your past experience, come up with a fee that you want to charge your clients. You can have a one for all price, package your services in packages or charge an hourly rate. The choice is yours. Do some background research on how other digital marketing freelancers are charging so that you don’t step too far from current industry-standard rates. Now you’re ready to make some money! You can now start looking for clients who can pay you some real cash. Finding clients won’t be a walk in the park and will require lots of effort at first. But don’t get disheartened by this! – Ask for referrals from friends and family. Let your former colleagues know that you’re now running a freelance digital marketing business and ask them to recommend you to people in need of your services. – Approach local digital marketing agencies and pitch your services. There are lots of agencies that prefer to work with freelancers than hiring full time staff and this could be a great way for you to get started and build your portfolio. – Browse jobs boards that offer freelance jobs to digital marketers. There are lots of online jobs boards that you can use to find new clients. More details about where to find work, below. Keep reading. Attend meetups and conferences related to digital marketing. Here you will not only learn about new trends in the industry you also get to meet prospective clients. Find online communities where other freelancers hang around and join them. Facebook and LinkedIn are a good source for digital marketing communities where you can learn from others and get client leads too. 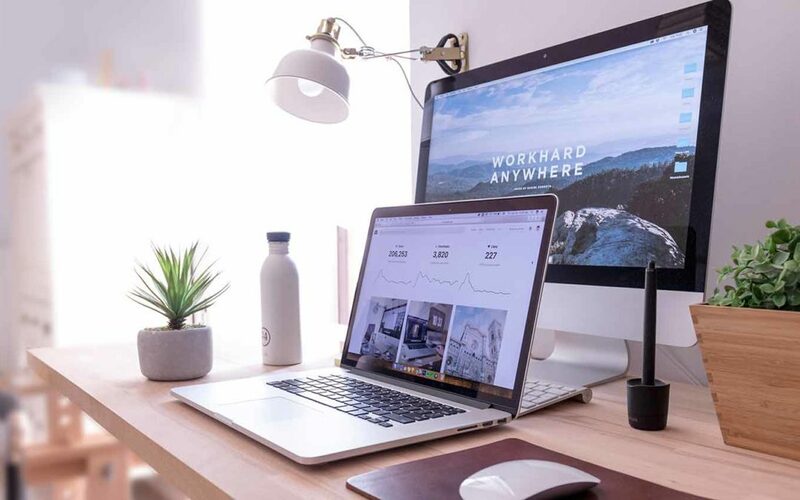 Interested in learning how to set up a successful freelancing business that will allow you travel the world as a digital marketer or any other digital nomad job? Checkout our program called The Digital Nomad Roadmap that teaches you EXACTLY how. Whenever you get client work, always ask them for a review after you complete the job. Don’t forget to also request your LinkedIn connections for reviews (recommendations). These go a long way to highlight your skills, experience and capabilities. Add a portfolio on your website and list all your past works. Here you can include the clients you’ve work with, graphics you’ve created, published works and even any case studies that you’ve done. Upwork is a huge jobs site, one of the most popular ones actually. Upwork has lots of digital marketing jobs including social media marketing, content writing, blogging, social media graphics creation, Instagram marketing, email marketing, Facebook ads jobs and so much more. FlexJobs is another site like Upwork offering lots of opportunities for freelance digital marketers. Jobs are available on full time, part time and remote basis. Freelancer, just like Upwork, has millions of jobs available. As a member of the site, you will be required to participate in contests in order to win the jobs available. Inbound.org this is more of an online community for marketers than a jobs board. However, occasionally there will be jobs posted on the platform. Remote OK offers remotes jobs only. This is great for any digital wannabe. Here you can find all sorts of digital marketing jobs that you can apply to find your first client. Indeed is popular among UK and US clients. There are lots of freelance digital jobs on the site that you can apply for. Subscribe to the email list and receive daily job posts in your inbox. Mashable Jobs Board is dedicated to connecting digital marketers with relevant clients. The jobs board is run by Mashable one of the most popular digital media websites. Digital marketing is currently undeniably one of the best industries to get paid while you travel the world. It really is a job that you can do from anywhere. One, because you can easily learn a marketable skill and setup your remote business in no time. Two, to start working, you simply need is a computer and an internet connection and you’re good to go. This is all that digital nomads need to take their businesses on the road! Three, you can start small scale and keep growing. When you run your own digital marketing business, you will no longer work on commissions. There is no limit to how much you can earn or grow. This is a good thing as it will sustain your time on the road. One of the tools for success for any digital nomad is sustainability. The nature of digital marketing makes it one of the most sustainable services you can offer because it is always evolving and growing. You have the chance to continue reinventing yourself for further growth.